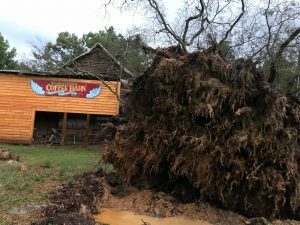 A 175-year-old oak tree fell and damaged the Coffee Barn at the Shakori Hills Community Arts Center during a storm this week. 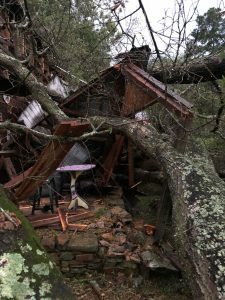 Officials said the storms that rolled through central North Carolina on Wednesday night caused the tree to fall on the organization’s property in rural Chatham County. Music festivals and other events are held throughout the year at the property southwest of Chapel Hill. 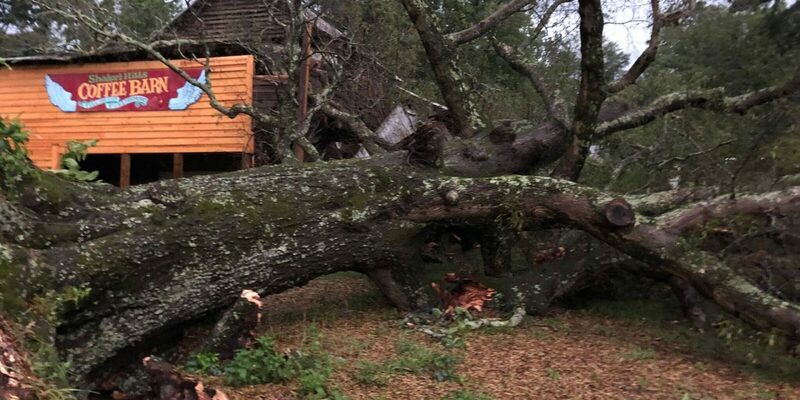 Shakori Hills Community Arts Center president Carol Woodell said that no one was injured when the tree fell. Four festivals are scheduled and expected to draw thousands to the grounds over the next two months: The Big What? August 16 – 18; Hoppin’ John Old-Time and Bluegrass Fiddlers’ Convention, September 13 – 15; Shakori Hills GrassRoots Festival of Music & Dance, October 4 – 7; and REI’s Outessa Fest, October 20. Anyone who would like to donate to support the cleanup effort can do that through the organization’s website.